Yet another design for Pinguino !! Vasile designed a new 18F4550 board with external power supply. 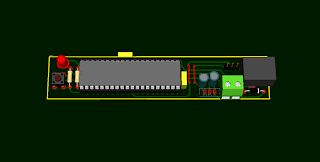 He used Kicad to draw this board. He’s currently testing this version and files will be available soon. Does this board work with all SO? Or only with linux? You mean, Pinguino board in general? Pinguino board is based on 18F2550/4550 microcontrollers which have their own internal "language", not depending on any Operating System. But the IDE used to program it, need to work on an OS. If you browse the blog, you can find that here are versions of this IDE on Windows, Linux, Mac OS X.
Ok, I Knew it, but I refered only 4550 tiny, because in hacking lab site says that this board only works under Linux. But if you said to me that this board works under all SO, perfect. Is it possible to have the schematic for this 4550 board ? Thanks a lot.